In 1959's Rio Bravo, there’s a scene where four gunmen get the drop on Sheriff Chance, played by John Wayne. In fact, if it weren’t for the quick thinking of Ricky Nelson's character, Colorado Ryan, Chance would've surely been dead. Shots ring out, and when the dust settles, all four of the baddies are lying face-down in the dirt. It’s a scene you'll find in hundreds of westerns; the good guys shoot the bad guys dead, end of trouble and end of story. But what exactly does it take to shoot a man? How many do you have kill before it comes as easy to you as it did Chance and Colorado? Are they haunted by the faces of those they’ve killed over the years? Rio Bravo isn't the type of movie that will ask these questions. In Clint Eastwood’s Unforgiven, the director spends the better part of two hours trying to answer them. Early in life, William Munny (Clint Eastwood) was a violent outlaw, a ruthless killer who'd shoot you just because he felt like it. Now, he spends his days as a quiet widower, working his farm and raising his two young children. Munny comes out of retirement, however, when he hears some prostitutes in the town of Big Whiskey have posted a $1,000 reward; it seems two cowhands went a little crazy and cut up a whore's face. So, along with his old friend Ned Logan (Morgan Freeman) and a young gunslinger named the Schofield Kid (Jaimz Woolvett), Munny sets out to do the job and collect the reward. But Big Whiskey’s Sheriff, Little Bill Daggett (Gene Hackman), has no intention of allowing any murders to occur in his town, and plans to exact some ‘justice’ of his own on anyone foolhardy enough to try. Violence touches the lives of each and every character in Unforgiven. First and foremost, we have Will Munny, played to perfection by Clint Eastwood. At one time a real hell raiser, Munny never thought twice about drawing his gun in anger. Nowadays, retired and with kids to look after, he has time to reflect on all the men he's killed. “You remember that Drover I shot through the mouth whose teeth came out the back of his head?” Munny asks Ned one night. “He didn’t do anything to deserve to get shot…at least nothing I could remember when I sobered up”. On the flip side, we have Little Bill, the sheriff of Big Whiskey and a role that won Gene Hackman the Academy Award for Best Supporting Actor. Bill is a law and order man through and through, yet his brand of justice is as cold-blooded as the criminals he hunts down. When the reward money lures English Bob (Richard Harris), a British gunslinger, to town, Little Bill and his deputies stop him in the streets and beat him unmercifully. For Bill, the beating is a warning to anyone who may come to collect this blood money, but he's as much a part of the problem as he is the solution, and his tactics will lead to an unexpected showdown. Unforgiven even looks at the violence from an outsider's perspective. W.W. Beauchamp (Saul Rubinek) is English Bob's companion, a writer from the East who’s penned a book titled The Duke of Death, in which he romanticized Bob's exploits, casting him as a sort of “Robin Hood” of the West. Beauchamp himself never once held a gun, so when Little Bill’s deputies point theirs directly at him, it’s an eye-opening experience. All at once, the romance that Beauchamp had associated with gunslingers started to melt away. “It’s a hell of a thing, killing a man”, Will Munny says. “You take all he’s got, and all he’s ever gonna have”. In Unforgiven, Eastwood shows us, in a deeply dramatic way, just what that means. Not a single shooting in this film goes unnoticed, and no character fires a gun and laughs about it. Each time one of these men pulls the trigger, it’s as if a part of their soul abandons them. It really must be a hell of a thing...killing a man. Hell of a review. I'm curious on how you think this film stacks up against the classic westerns. Jeremy: Thanks for stopping by, and for the comment. I'm a real fan of Western movies (John Ford is one of my all-time favorite directors), but what I liked about UNFORGIVEN was how it stripped away a lot of the mythos associated with the genre. For one, it erased the line between the good guys (Little Bill) and the bad (Munny), showing there wasn't always a clear-cut difference between the two. I also liked the scene where Hackman's Little Bill is telling the reporter the truth about English Bob, how his "heroic" exploits were anything but, and all English Bob can do (Harris also gives a tremendous performance) is sit there and listen, a bit embarrassed by it all. 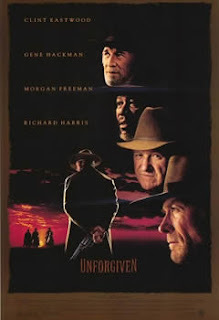 Along with the similarities between the heroes and the villains, UNFORGIVEN shows how embellishment and exaggeration can easily turn one into the other. As for where it ranks, UNFORGIVEN is definitely among my Top-10 Westerns of all-time. I do still hold a special place in my heart for the classics (I'd rank Ford's THE SEARCHERS above this movie), but it's the different takes on the genre I find most appealing (my 2 favorite westerns are McCABE & MRS. MILLER and ONCE UPON A TIME IN THE WEST), and I definitely include UNFORGIVEN in this category. Thanks again, and have a good one!